However, there’s another twist that will make the impact of your Father Daughter Dance one that no other wedding reception has — and that’s to record a special message. This idea is best described below, taken from page 174 of Peter Merry’s book, The Best Wedding Reception…Ever! One way to enhance the emotional impact of your special dances is to record a special message that can either precede or be mixed into the song during the instrumental segments…it will not only make your dance more personalized and memorable, but it can also be a nice surprise. The book labels this creative idea as one of the most difficult to get right. It is very important that the wedding MC/DJ understands how to do this properly so that it receives the proper flawless presentation. This person typically will need strong editing skills to create edits that are both technically superior as well as emotionally powerful. When in doubt, ask for a sample recording. 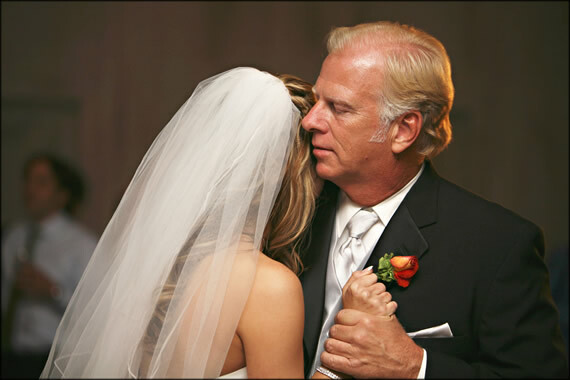 What’s your favorite selection for a Father Daughter Dance? Reply and let the world know in the comments section below! Special thanks to LucieXYZ Photography for this blog image, which was taken from a wedding we worked together at Holman Ranch in Carmel Valley.